"OFR" redirects here. For other uses, see OFR (disambiguation). The Department of the Treasury is an executive department and the treasury of the United States federal government. It was established by an Act of Congress in 1789 to manage government revenue. The Department is administered by the Secretary of the Treasury, who is a member of the Cabinet. Jacob J. Lew is the current Secretary of the Treasury; he was sworn in on February 28, 2013. The first Secretary of the Treasury was Alexander Hamilton, who was sworn into office on September 11, 1789. Hamilton was asked by President George Washington to serve after first having asked Robert Morris (who declined, recommending Hamilton instead). Hamilton almost single-handedly worked out the nation's early financial system, and for several years was a major presence in Washington's administration as well. His portrait is on the obverse of the U.S. ten-dollar bill while the Treasury Department building is shown on the reverse. Besides the Secretary, one of the best-known Treasury officials is the Treasurer of the United States whose signature, along with the Treasury Secretary's, appears on all Federal Reserve notes. ...it shall be the duty of the Secretary of the Treasury ...to execute such services relative to the sale of the lands belonging to the United States, as may be by law required of him; to make report, and give information to either branch of the legislature, in person or in writing (as he may be required), respecting all matters referred to him by the Senate or House of Representatives, or which shall appertain to his office; and generally to perform all such services relative to the finances, as he shall be directed to perform. (a) The Department of the Treasury is an executive department of the United States Government at the seat of the Government. (b) The head of the Department is the Secretary of the Treasury. The Secretary is appointed by the President, by and with the advice and consent of the Senate. President George Washington appointed Alexander Hamilton as the first United States Secretary of the Treasury on September 11, 1789. He left office on the last day of January 1795. Much of the structure of the government of the United States was worked out in those five years, beginning with the structure and function of the cabinet itself. First Report on the Public Credit: Communicated to the House of Representatives, January 14, 1790. Operations of the Act Laying Duties on Imports: Communicated to the House of Representatives, April 23, 1790. Second Report on Public Credit – Report on a National Bank. Communicated to the House of Representatives, December 14, 1790. Report on the Establishment of a Mint: Communicated to the House of Representatives, January 28, 1791. Report on Manufactures: Communicated to the House of Representatives, December 5, 1791. 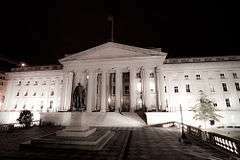 Congress transferred several agencies that had previously been under the aegis of the Treasury department to other departments as a consequence of the September 11, 2001 terrorist attacks. Effective January 24, 2003, the Bureau of Alcohol, Tobacco and Firearms (ATF), which had been a bureau of the Department since 1972, was extensively reorganized under the provisions of the Homeland Security Act of 2002. The law enforcement functions of ATF, including the regulation of legitimate traffic in firearms and explosives, were transferred to the Department of Justice as the Bureau of Alcohol, Tobacco, Firearms, and Explosives (BATFE). The regulatory and tax collection functions of ATF related to legitimate traffic in alcohol and tobacco remained with the Treasury at its new Alcohol and Tobacco Tax and Trade Bureau (TTB). Effective March 1, 2003, the Federal Law Enforcement Training Center, the United States Customs Service, and the United States Secret Service were transferred to the newly created Department of Homeland Security ("DHS"). With respect to the estimation of revenues for the executive branch, Treasury serves a purpose parallel to that of the Office of Management and Budget for the estimation of spending for the executive branch, the Joint Committee on Taxation for the estimation of revenues for Congress, and the Congressional Budget Office for the estimation of spending for Congress. From 1830 until 1901, the responsibility of overseeing weights and measures was carried out by the Office of Standard Weights and Measures, which was part of the U.S. Treasury Department. After 1901, the responsibility was assigned to the agency that subsequently became known as the National Institute of Standards and Technology. Organization of the U.S. Dept. of the Treasury. The Office of Foreign Assets Control and the main branch of the Treasury Department Federal Credit Union are located in the Treasury Annex in Washington, D.C.
"Eagle and Treasury Seal", made by United States Bureau of Engraving and Printing engraver John Eissler in 1921. The engraving was originally used on official Treasury letterheads. Treasury Regulations reflect the Treasury's interpretation of the IRC, may be promulgated by the Secretary of the Treasury, and when final they have "force of law" status. Congress can sometimes carve out areas in which the Treasury can actually make, not just interpret, the rules. Revenue Rulings are issued under the same statutory authority as regulations, but generally are just a response to a taxpayer's question about their own tax liability. Published Revenue Rulings are released in the weekly Internal Revenue Bulletin and, in the past, in the semi-annual Cumulative Bulletin; they do not have the force or effect of regulations, but nonetheless may be cited and used by the public. Private Letter Rulings are also the IRS' response to a specific taxpayer's question regarding the tax consequences of a particular transaction and can be made public upon request. Although they may not be relied on by anyone other than the taxpayer that requested it, they are still useful for tax planning purposes. A Revenue Procedure is a statement of the Treasury's practice and procedures, and generally deals with a broad subject area. The Office of the General Counsel is charged with supervising all legal proceedings involving the collection of debts due the United States, establishing regulations to guide customs collectors, issuing distress warrants against delinquent revenue collectors or receivers of public money, examining Treasury officers' official bonds and related legal documents, serving as legal adviser to the department and administered lands acquired by the United States in payment for debts. This office was preceded by the offices of the Comptroller of the Treasury (1789–1817), First Comptroller of the Treasury (1817–1820), Agent of the Treasury (1820–1830), and Solicitor of the Treasury (1830–1934). In the latest Center for Effective Government analysis of 15 federal agencies which receive the most Freedom of Information Act FOIA requests, published in 2015 (using 2012 and 2013 data, the most recent years available), the Treasury earned a D by scoring 68 out of a possible 100 points, i.e. did not earn a satisfactory overall grade. ↑ "An Act to Establish the Treasury Department" (PDF). September 2, 1789. Retrieved 2014-11-05. ↑ "U.S. Treasury – Act of Congress Establishing the Treasury Department". Treasury.gov. 2010-10-26. Retrieved 2014-07-14. ↑ Records of the National Institute of Standards and Technology (NIST), National Archives website, (Record Group 167), 1830–1987. ↑ I.R.C. Section 197(g), 469(l), 1017(b)(1). ↑ Treasury Order 101-05, U.S. Dept. of the Treasury. 10 January 2011. Updated 26 April 2011. Accessed 11 November 2012. ↑ DF Org Chart, "The Office of Domestic Finance". U.S. Dept. of the Treasury. October 2011. Accessed 11 November 2012. ↑ International Affairs, "About International Affairs". U.S. Dept. of the Treasury. 14 February 2012. Accessed 11 November 2012. ↑ Terrorism and Financial Intelligence, "About Terrorism and Financial Intelligence". U.S. Dept. of the Treasury. July 2, 2012. Accessed November 11, 2012. 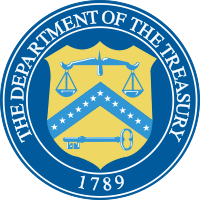 Wikimedia Commons has media related to United States Department of the Treasury. Annual Reports of the Secretary of the Treasury on the State of Finances – These annual reports also contain the reports of the many departments of the Treasury, including the Bureau of the Mint, Bureau of Engraving and Printing, Bureau of Customs, Office of the Comptroller of the Currency, Secret Service, and the Internal Revenue Service.